Hotels in Porto are great value. You can walk around the whole city so can stay wherever has the best offer. The historic center of Porto is a UNESCO heritage site. If you want a true Portuguese experience then Porto will deliver. You’ll find colorful houses and narrow Portuguese tiled streets. There are several buildings covered in the famous blue Portuguese tiles known as azulejos. The locals are surprizingly friendly towards foreigners for such a big city. 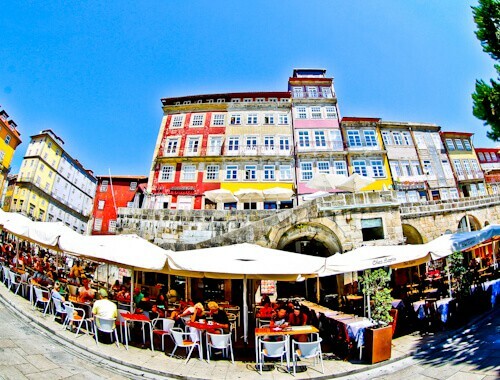 Foodies will love Porto with the tables outside on the streets. These restaurants can also make a good place to enjoy a cold local beer such as Super Bock or Sagres. As you are in Porto you may enjoy a glass of the worlds best port as you watch the world go by. 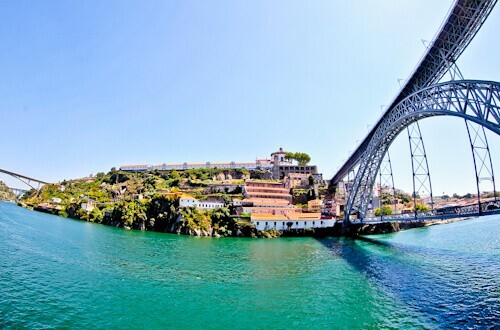 The historic center of Porto is connected to Vila Nova de Gaia by several bridges. These bridges are crossing is the river Douro. The most famous bridge in Porto is the double decker bridge of Dom Luis I. Originally this bridge was going to be a single decker crossing designed by the famous Gustave Eiffel. The population of Porto was growing quickly when the bridge was being planned in the late 19th century. Due to the growing population they chose a double decker bridge designed by Theophile Seyrig who learnt his trade from Mr Eiffel. There is a Gustave Eiffel bridge you can visit in Porto. Two bridges to the east of the Dom Luis I bridge is the Maria Pia bridge (above left). The bridge is no longer in use but is of interest as it was designed by Mr Eiffel. The monastery dates back to the 16th century. The church and its cloisters are laid out in a circular design which is unique to Portugal (above). If you walk from the historic town on the top deck of the Dom Luis I bridge you’ll have wonderful views of the monastery. You see good views of it from the other side of the banks of the Douro river too. The views of the city, river and bridges are incredible from the monastery. 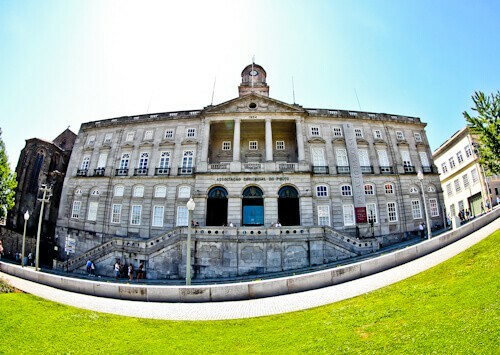 Completed in 1957, the Porto City Hall is a relatively young building. It’s located in the center of the historic city on a huge promenade. You see many hotels and high streets shops in this area. There are huge classic Portuguese buildings lining each side of the street. You can get a wonderful reflection shot of the City Hall using the pond in front of it. 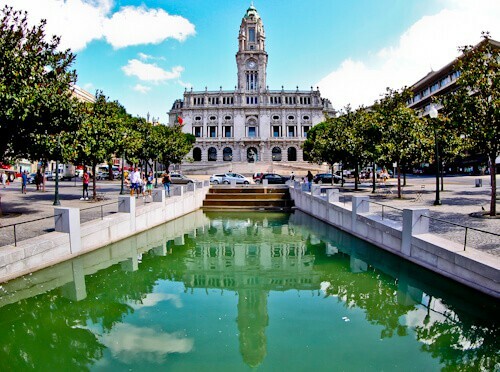 Sao Bento train station is located in the center of the historic city. 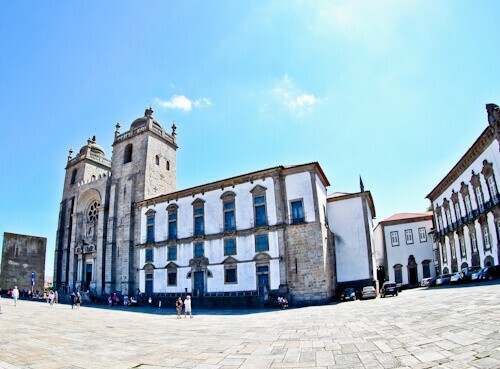 It’s located in between Porto Cathedral and the Town Hall. 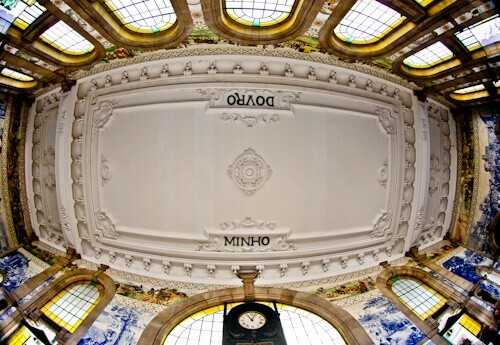 Even if you’re not arriving or leaving Porto by train it’s worth checking out the interior. The walls are decorated with the Portuguese tiles (azulejos). There are no barriers so you can explore as much of the station as you wish. It’s a wonderful location for your Instagram shots. The Porto stock exchange palace was built during the 19th century. It was built to increase the prosperity of Porto during that time. You can visit the interior and it is said that it was inspired by the famous Alhambra in Granada, Spain. Today the palace holds conferences and exhibitions. The Lello Bookstore is the most beautiful book store in the world. I would completely agree with this statement if there were not hundreds of people visiting the place. To enter you must buy a €5 gift voucher to spend in store. Once you have bought the gift voucher you then join the huge line waiting to go inside. If you look at pictures on Instagram of the interior it is a truly stunning book shop. But will your pictures be as stunning when the book shop is full of tourists? I doubt it. The whole process of buying a coupon, lining up, waiting and going inside seems to be a huge tourist trap. If you did pass and there was no-one lining up with few people inside then I have no doubt that it would be a worthwhile experience. Porto Cathedral is one of the oldest structures in the city. The architecture is a mixture of Baroque and Roman. On the square in front of the cathedral you get some good views of the colorful houses of Porto and Vila Nova de Gaia. From the cathedral it’s a steep walk through colorful narrow streets to the banks of the river Douro. 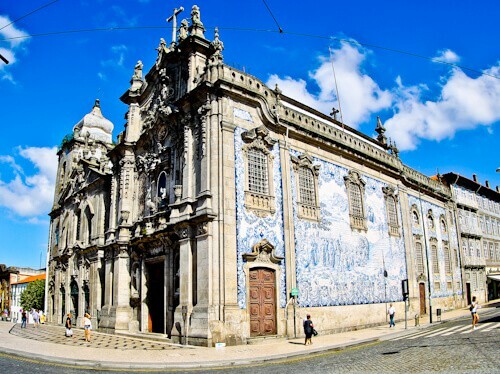 The Carmo and Carmelitas churches are stunning on the exterior with their typical Portuguese tiles (azulejos). You’ll see a lot of Instagram poses being made in front of the azulejos. Another church in Porto that photographs well is the Church of Sao Francisco. This photographs amazingly from the interior. 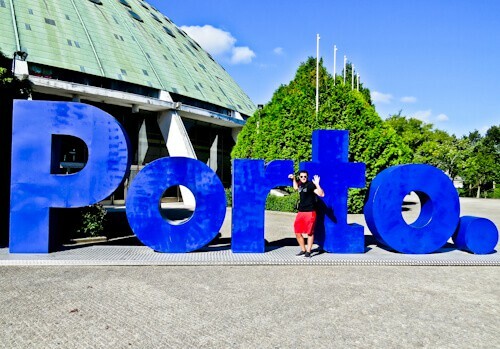 No visit to Porto is complete without getting a photo in front of the Porto sign. When I was in Porto the sign was in the gardens of Crystal Palace. The sign does move though as it has been in front of the town hall before. Along the banks of the Douro river on the Vila Nova de Gaia side there are lots of port bars. You can visit the caves of the major Porto port companies. On a cave tour you’ll learn about the ageing process of port. 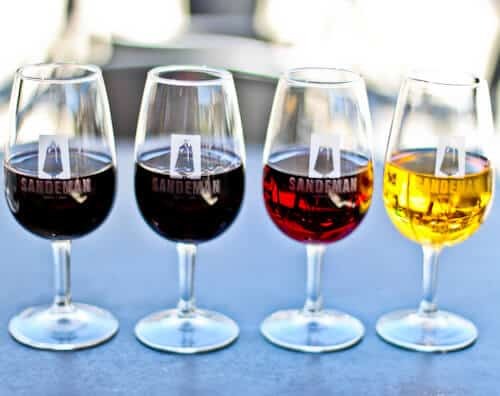 I decided to sit in the outside bar of Sandeman and learn about port by drinking it. If you order a few different glasses and tell the waiter you want to learn about port he’ll be happy to help you best learn. If you’re not a port fan they also serve ice cold sangria. The view from the Sandeman bar is the Douro river and colorful houses of Porto. 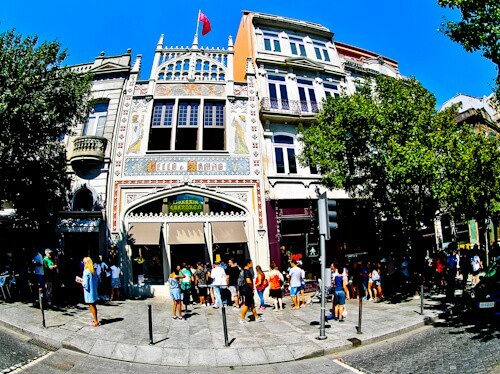 Would you prefer to be enjoying a glass of port or waiting in line to visit the over crowded Lello Bookstore? It’s best to explore Porto on foot. I’d definitely recommend visiting all the points of interest I’ve listed. As you are walking between the points of interest you’ll see so many Instagrammable, colorful and classic Portuguese subjects. If I could recommend one city which sums up Portugal it would definitely be Porto. The bus from Porto to A Coruña, Spain takes around 6 hours. This is on a very convenient direct bus which you can book online. It would make sense to stop at Santiago de Compostela on the way. The reason I didn’t stop there is because I am saving this destination for when I walk the Camino de Santiago in the future. Porto and the north of Portugal in general is one of my favourite places in Southern Europe. Sao Bento station is incredible and I totally agree about the bookshop; so crowded, and I think JK rowling wrote there too?? A stunning city with very friendly people! This looks like such a lovely place to visit and I love that you can pretty much explore it all on foot. I love the buildings and the colorful way they are decorated/painted. The inside shot you took of the railway station is just amazing…such a beautiful interior. A shame about the popularity of the bookstore to the extent that it is essentially too crowded to get good photos, although the rest of the city really does seem to make up for it. Porto is so lovely. Have seen many of those blue Portuguese tiles in Goa, India. (There was Portuguese rule in Goa) Those colorful houses give this city a strong character. This is picture postcard perfect. Porto looks so beautiful, I have seen a few other posts on the town, and they all looks so bright and colourful. it looks like a great place for exploring and a relaxing getaway! I’ve been meaning to get to Portugal for so long! 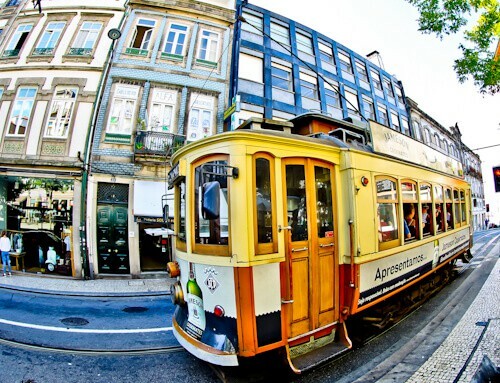 Porto is actually on my list of places to possibly go to with my girlfriend for New Years celebrations this year. It seems like such a beautiful coastal city, and of course with GREAT food, and wine ;), to boot! The bookstore, which I never heard of, is definitely quite beautiful but I am SO with you on the little attractions like this one getting overrun by tourists. It’s unfortunate that their popularity ruins the actual charm and wonder of these places. Still might take an Instagram in front of it though…! 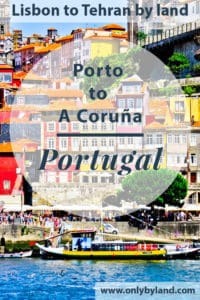 Thanks for sharing, I shared this with my girlfriend to see what she thinks of going to Porto for New Years 🙂 cheers! Wow, that Lello bookstore looks absolutely amazing. I can totally understand why there would be such a long line to get in. And even though it is a pain that they’re even making you purchase a voucher to spend, I can understand that from a business perspective. I guess this is where being the early bird would definitely be a bonus! Visiting that bookstore is one tourist trap I would gladly pay and wait to get into! I’ve wanted to see it forever before I even knew JKR was inspired to write HP there! I had no idea Port is crafted here. I guess I could have assumed that since it is in the name. The city looks beautiful,especially with the blue tile all,over. I like that cities are making their own signs like I Amsterdam and Porto. I’m very interested in the Gustave Eiffel connection. I would love to see the bridge he designed for myself and even stand on it. This is a charming city and with tons to do of my interest. I sure would love to see Mr. Eiffel’s bridges 🙂 and then of course, a tour of the UNESCO heritage sites and centre. Porto wine tasting would also be high on my list. Well done with the quick snippets of the place. 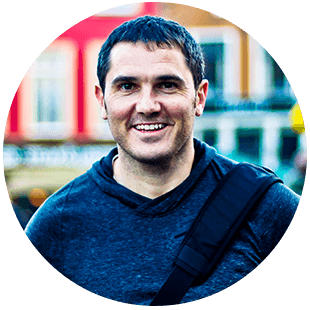 The pictures are lovely though I am curious – did you use a goPro or a wide angle lens for it? I love the colorful houses of the UNESCO historic center. I would take so many photos and what a unique looking town hall structure. The port tasting on sounds like a fun experience too! yes, or a glass of port! Porto is a charming city. 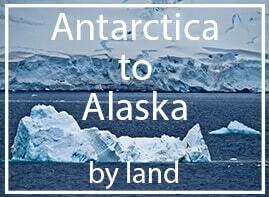 The fact that it is a UNESCO world heritage site, only adds to the allure. I found it really fascinating to note that a bridge here has been designed by Gustave Eiffel. Also, there is another one designed by his protege. Would love to see these bridges some day. I was recently where some flights will allow you to take a 5 day layover for free in Lisbon so that would be the perfect opportunity to travel to Porto! I love this historicness and that you can see the whole city on foot! I always need to burn off some calories from all the amazing food. Wine tasting would be top on my list! I like your alternative to visiting the bookstore. Drinking and learning about port sounds like a great plan to me! Totally fell in love with Porto on my visit last year! Loved the old world as well as easy going charm of the city… thanks for refreshing my memory of the trip! Love Porto, such a cool city. You’ve definitely covered a lot of the best spots in the city. Porto is high on my bucket list! Have yet to visit Portugal but will be heading to Porto when we do!